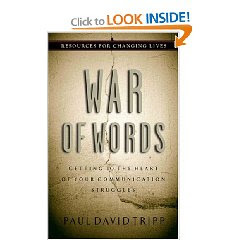 This is the best book I have ever read on the struggle we have in communication, and I've read plenty. I am often quick to speak, and I find myself regretting the words that come out of my mouth. I know my tongue can be a dreadful thing, used to cut like a sword or flatten like a pancake those who are messing up my world. I have memorized many a verse that addresses the tongue, but it's still a struggle for me to not let ANY unwholesome talk come out of my mouth. That's why Paul Tripp's book is such a godsend. He doesn't beat his readers up with rules, "Do not gossip", "Do not lie", "Do not speak unkindly"... etc. He sets the stage at the beginning, before the first words were spoken by man in the garden of Eden. He reminds us that the Creator who SPOKE the universe into existence is the Great Speaker. "The wonder, the significance, the glory of human communication has its roots in his glory and in his decision to talk with us and allow us to talk with him and others. . . Words belong to God, but he has lent them to us so that we might know him and be used by him." Words do not belong to us. Every word we speak should reflect God's glory. Our words belong to Him. When the Serpent entered the garden and spoke to Eve, the war of words began. For the first time, a lie was spoken. For the first time, too, people spoke against each other. For the first time, words of accusation were spoken against God. Life is War. There's a battlefield in our homes, in the workplace, in the church, in the community. There's a dramatic conflict between the spiritual forces of evil in the heavenly realms and the people of God. There are things we need to understand about this war. Understand God is Sovereign. He rules, unchallenged, over the universe. No one has taught God, no one give him advice, no one can legitimately question him, and no one can stand in the way of his will. He sits on the throne of the universe, and he alone rules. He rules over all things for the church. He controls the universe so that his redemptive purpose for us and his redemptive promises to us will be fulfilled. If we understand that the God who loves us - who called us by His grace and for His own glory, who is in control of every aspect of our lives and will without a doubt keep every promise He has made - if we understand that this God orders every moment of our lives, how will it change the way we speak with one another? He rules over the specific details of our lives. Don't like the car you drive? Don't like your home, your job, your finances? God designed it perfectly for you. Does your talk express envy towards those who have what you long for? Are you missing the fact that God is active in every moment of our lives? Are you forgetting that He brings all things into our lives for our redemptive good? He rules over every aspect of our salvation. We are utterly dependent on Him. Apart from His grace, there is no hope for us. We owe a debt we cannot pay. And the greatest gift of all is clearly stated in John 3:16. He gave His only begotten Son. He rules over circumstances for our sanctification. He's at work in each and every situation, conforming us to the image of His Son. He doesn't just save us and leave us... He works in us (We are His workmanship, created in Christ Jesus unto good works. Eph. 2:10). Remember, God sends trials into our lives for His good purposes. We're to count them all joy. We're to trust Him in the storms of life, knowing that He will never leave us, nor forsake us, and that He is always in control. We must remember the presence of a Sovereign God, and the truth of His sanctifying control over our circumstances. He rules over relationships for my sanctification. The people in our lives are not there by accident. That woman who is very needy, that man who is overly friendly, that obnoxious neighbour... all of them are instruments in the Hand of God. Stop treating people as irritants and obstacles, and see them for who they are - special, created beings, placed in your life for a reason. What does God want you to learn from them? 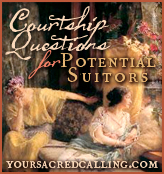 How does God want you to minister to them? He rules over all things for His glory. In light of this, every word we speak should bring God the glory He deserves, and should bring redemptive good into the lives of the people God has placed around us. This high calling for our words - worship and redemption - is why there's a war of words. The Enemy wants us to speak our of our own will, to speak for our own glory. He wants us to speak out of selfish hearts committed to what seems best for us. But we're called to be different. We're called to be a peculiar people. I can't wait to borrow it. Thanks for the review....looks like a good read.